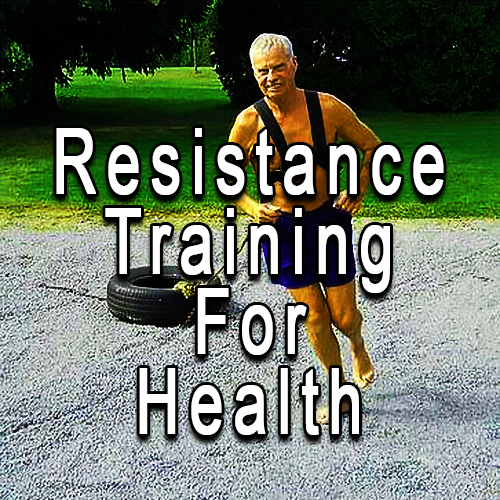 I practice Resistance Training for Health. I do this every day. To keep a man or a horse healthy you must keep it strong—because nature designed us to meet adversity and survive. Also, it is more fun to go through life as a healthy person. Nature planned that too. Resistance training and aerobics can be a fun way to keep strong and healthy. This can be a lifelong pursuit. Ten years ago, at the age of 69 years, I had an occasion to replace the starter-motor in my beloved 1949 forklift. This is an old monster that I keep around because it will hoist 6,000 pounds to about 10 feet. Also, I keep it to drag trees for the winters’ firewood and other fun tasks. Besides that, I am fond of it. This week I got the poor critter stuck in the loose sand, dirt and muck, and the starter-motor quit—right there. So, I had the wonderful opportunity to crawl under and remove the darned thing. Ten years ago I did the same job and needed help to getting the starter up under the engine. However, this time I crawled under and with one hand held it and used the other hand to put in the bolts. I realize this sounds braggadocios but my goal here is to encourage other folks to practice healthy living. The young ladies at the local “Y” get the credit. They put me through the aerobic and strength building classes. Two or three one-hour classes each week will do a lot of good. Additionally, this is an appropriate time to say that I am 79-years old and not an ache or pain and no meds. Aerobic exercises are a wonderful way to maintain a healthy body, with or without weight lifting. Also, cardiac exercise can be tailored to match your needs and cost very little or nothing. The Cleveland Clinic (1), the Mayo Clinic, and the local “Y” can be helpful for your needs. That starter motor goes bad about every ten years. I will be close to 90 by that time, and I get the sneaking suspicion that my fitness program had better be adhered to. I better eat well—and will be nice to myself too—if I am to stay healthy. Basic foods and a good exercise program are within our reach. We only need to do a little more each day toward our individual goals. Select the foods that we know are the right ones and avoid the others. I will spend the rest of my life trying to coax other folks to live healthy lives—that is my personal goal.